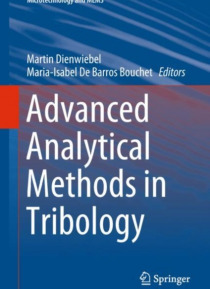 This book presents the basics and methods of nanoscale analytical techniques for tribology field. It gives guidance to the application of mechanical, microstructural, chemical characterization methods and topography analysis of materials. It provides an overview of the of state-of-the-art for researchers and practitioners in the field of tribology. It shows different examples to the application of… mechanical, microstructural, chemical characterization methods and topography analysis of materials. Friction and Wear phenomena are� governed by complexe processes at the interface of sliding surfaces. For a detailed understanding of these phenomena many surface sensitive techniques have become available in recent years. The applied methods are atom probe tomography, in situ TEM, SERS, NEXAFS, in situ XPS, nanoindentation and in situ Raman spectroscopy. A survey of new related numerical calculations completes this book. This concerns ab-initio coupling, numerical calculations for mechanical aspects and density functional theory (DFT) to study chemical reactivity.